Harris Corporation (NYSE: HRS) has delivered the advanced navigation payload for the fourth GPS III Space Vehicle (SV04) to Lockheed Martin — two payloads were delivered in 2017 and the company is committed to delivering four more in 2018. 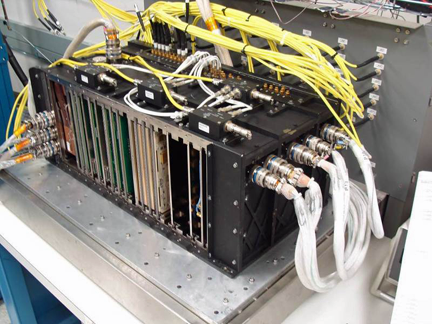 The Harris advanced MDU for GPS III Space Vehicles 1-10. Harris is under contract with Lockheed Martin for 10 GPS III navigation payloads. The first payload is fully integrated on the U.S. Air Force’s first GPS III satellite, GPS III SV01, which was declared Available for Launch in September, with an expected launch in 2018. The payload moved flawlessly through space vehicle integration and test — exceeding specification requirements. Harris’ second, third and fourth navigation payloads have been fully integrated on GPS III SV02, SV03 and SV04. The fifth payload for SV05 is in process of environmental testing. At the heart of Harris’ navigation payloads is a Mission Data Unit (MDU), featuring a unique 70-percent digital design that links atomic clocks, radiation-hardened computers and powerful transmitters — enabling signals three times more accurate than those on current GPS satellites. These payloads also boost satellite signal power, increase jamming resistance by eight times and help extend the satellite’s lifespan. In November, Harris announced that it had completed development of a fully digital MDU for Lockheed Martin’s GPS III satellites 11 and beyond. The new SV 11+ payload design will provide enhanced capabilities and increased performance for the Air Force. While the Air Force originally developed GPS for warfighters, millions of people around the world and billions of dollars of commerce now depend on the accurate, reliable signal created and sent by Harris navigation technology.